The human brain is constantly processing a wide variety of ongoing feedback from the world around it and then determining higher-priority experiences based on that feedback to gain a better understanding of any given real-world situation. Understanding the enigma of how the brain experiences visual, auditory, and tactile exposure can add significant wisdom and advantages to those who aspire to create superior products and digital experiences that positively impact a user’s memory and ultimate desire for engagement. 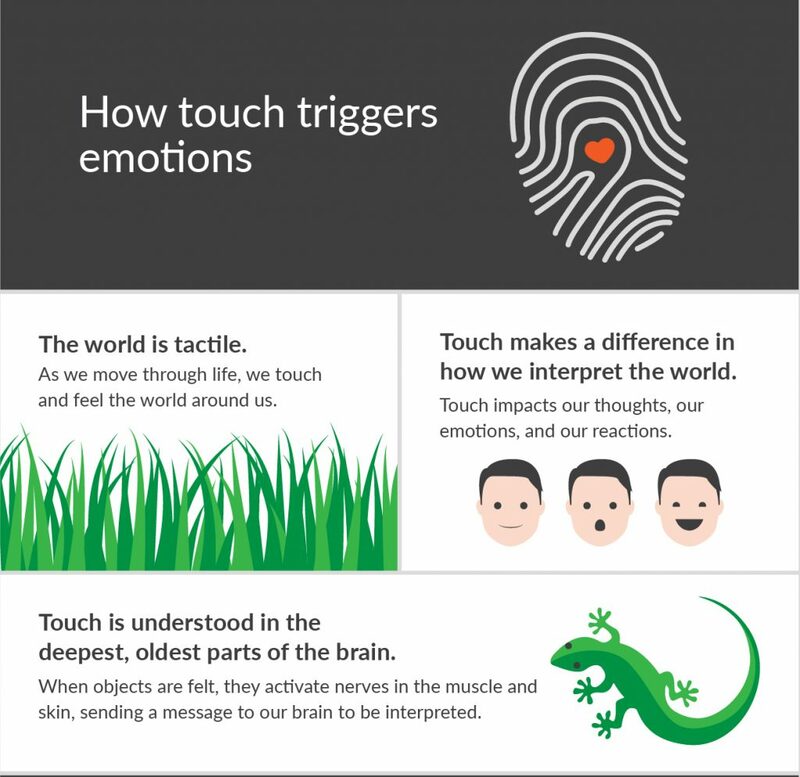 While a sense of touch can unquestionably trigger a deeper level of emotion, there are still many unknowns when it comes to what level of technology exposure can influence the brain positively in terms of perception, memorability, and emotion. There is a real challenge for many technologists at the forefront of designing the complex and varied digital experiences now available through wearables, mobile devices, game controllers, and household items. How can they calibrate sensory-driven engagements to the precise level that make people feel good and generate positive and memorable visceral and emotional reactions? This new Holy Grail of behavioral discovery is a major advancement in the understanding of how humans react to different types and levels of tactile exposure that can be applied across many industries and their respective design strategies. For device and system makers today, there are clearly established principles for designing engaging audio and visual user experiences. However, design practices for one of the most important senses — the sense of touch — is still early in its development. To better understand what is so easily perceived as the mystery of the human brain when it comes to touch technology, Immersion partnered with True Impact, a neuroscience research firm, on a study. The research was specifically designed to analyze a wide spectrum of brain activity when exposed to different levels of haptic technology used to create simulations of digital tactile experience and non-haptic design applications. The intention of the study was to discover which applications had more favorable and adverse effects on participants, and which could more effectively be curated and customized for positive and longer-lasting emotional experiences. The study used a variety of videos involving two distinctive types of consumer products. It tracked participants’ heart rate, cognitive load, visual attention, and arousal as a baseline measurement system when exposed to different levels of haptic technology compared to non-haptic scenarios. The results showed a remarkably strong case for haptics’ ability to affect appeal and interest. Many of the study’s subjects indicated content haptics were more approachable and persuasive. They also perceived haptics as adding to their positive memory of the experience. Participants across a broad range of demographics, ages, and technology affinities rated their experience and the products they observed with haptics at 18% higher when it came to quality of experience. The study also showed an 11% increase in brand value, and an average 40% increase of condition recall compared to non-haptic scenarios. And the variety and depth of additional insights provided unprecedented data points on how the human brain reacts to general and specific levels of tactile exposure. The end results proved that applying haptics is highly effective at shifting a user’s attention from one experience to a more emotionally compelling environment. Haptics can augment the visual and auditory user experience by creating sensory immersion in rich and compelling tactile effects that are fully realized in video, virtual reality, augmented reality, and many other formats. Touch and sensory experiences are a primal part of the human brain, and the sense of touch-enabled by haptic technology creates a powerful and lasting sense of experiential emotional reality for the brain as it navigates its way through moment-to-moment experiences. 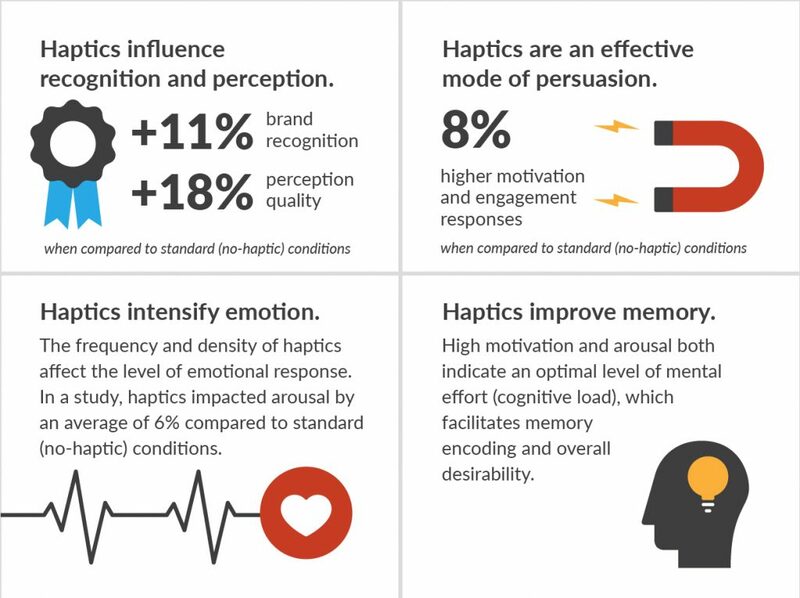 The positive and lasting effects of haptic design confirm its significance as essential to creating memorable and impression-based interactions that not only influence our reactions but more deeply connect us emotionally to the digital experience of the moment. Sanya Attari is the Manager of User Experience Research at Immersion Corporation. She leads research activities in a wide variety of verticals involving physical interactions, including smartphones, wearables, gaming, and automotive interfaces as well as content-based interactions and advertising. Her research background includes qualitative and quantitative user experience research at Cisco Systems and pervasive computing academic research during her Ph.D. studies at Virginia Polytechnic Institute.